Oh, book friends. I have been woefully underread (my computer auto-corrected this to "underfed" which is about the same thing - nice work, MacBook) this week, I'm sorry to say. I've been languishing in my bed, unwell and in such discomfort that I couldn't even enjoy anything that required more than a few hours of concentration. Barfing will do that for you, I suppose. The good news is that I did mentally reorganize my books, I actually physically began rehoming some books that I no longer want or need, and I did manage to read two short books! Megan Hunter’s debut as a fiction writer illustrates that she is, indeed, actually a poet. This slip of a novella - is a flashlight that roams, searching, alighting on the portentous and pedestrian alike, and cobbles together beauty from what’s found. This is the cataclysm - and after - and it cleaves so closely to the bone, it almost makes you ache. In a world of too much, Hunter’s spare and evocative story of a flood that nearly washed London away feels just right. An achievement and a treasure. Not just for fans of dystopia, either! Eminently useful for anyone who has been through the crucible and managed to emerge again - not unscathed, but not without hope, either. One final thing about the Hunter book: it's not very long. I think I read it in an hour and a half the first time. At first, I was glad I had just checked it out from the library, but now that I've had time to think it over, I'm pretty sure I'll buy my own copy, because I already want to return to it...and I want to be able to lend it out to friends! Without a doubt, this is one of the worst books I have ever read, and when I stop to consider that it’s written for young readers, I just want to scream. My daughter read this book and so I picked it up and read it afterwards. I knew it was about WW2 and the Holocaust, and the plot basically unspools itself within a couple of chapters and then you’re just left having to plod through the pages, growing increasingly irate. The book includes “wordplay” of the most utterly idiotic kind: “the Fury” is Father’s boss and the family is relocated to “Out-With.” FFS. Really? Either engage with the fiction that the story takes place inexplicably in English, or acknowledge that the perspective is that of an acutely ignorant German child. There’s nothing clever going on here (or elsewhere in the story, for that matter!). And then, at the very end, the coarsest wink and nod I’ve ever read, “Of course all this happened a long time ago and nothing like that could ever happen again. Not in this day and age.” I am fairly sputtering with the Fury. Boyne shovels spade and spade full of utterly relentless, stereotypical fakery and drivel at the tenderest of readers - a middle grade reader, just waking up to the world and a wide-eyed, defenseless kitten staring up for the first time at the bloody maw of history - expecting her to be taken in completely by his fable, and then he caps it off with the heartiest of middle fingers to the current state of international affairs? This is reckless and irresponsible writing and I may well put this waste of paper on a pike outside my front door as a warning to other awful books. It is long after lights-out here and my middle schooler is sound asleep, but I may just have to shake her awake and have a spirited discussion about the dangers of assuming all books have something worth savoring. Question authority, dear children of the world, especially when it plants itself before you as a tool of instruction and enlightenment. ...and that's a wrap on book reviews for the week. In the midst of my digestive woes this week, I did have two moments of total elation. The first one just made me swoon a little. If you've been reading my blog for a little while, you may have noticed that I reviewed Souad Mekhennet's stellar recent release, I Was Told to Come Alone: My Journey Behind the Lines of Jihad, last week. I tweeted it out, and tweeted her, too, asking if she would retweet the post if she found it worthwhile. Well, she did! And she featured it on her FB page, too! As a reader and a writer, I found it very satisfying that she read my review, and that she liked it, too! As an academic forced into early retirement due to health issues, I also found it really wonderful that I had connected with someone. It's so important, to feel connected to the rest of the world. It came at exactly the right moment, too, because I had a more isolating than usual week. If you're reading this, Souad Mekhennet, thanks for making my week and I'd love to see what's in your book bag sometime! 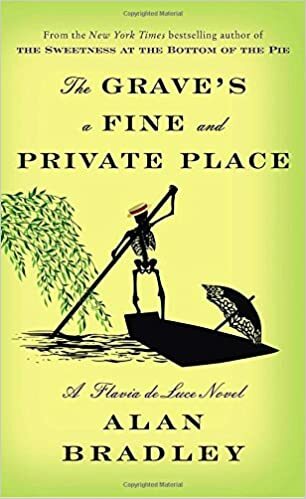 The other elation was a new book kind of elation: the latest book in the Flavia de Luce series arrived on my Kindle app!! 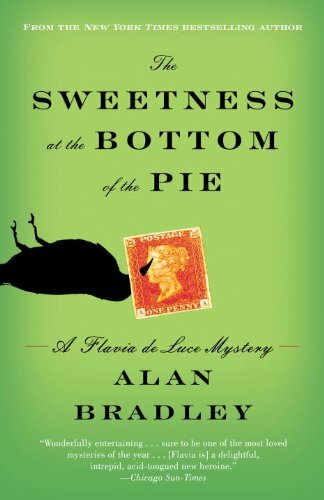 Alan Bradley started writing a series about the intrepid, indelible, intelligent Flavia several years ago, and I've been hooked since book one. Flavia is a schoolgirl living in post-WW2 England, and she keeps stumbling onto dead bodies, much to her delight and to the police commissioner's chagrin. Flavia's work solving all of these murder mysteries is joyful, even when there's danger involved. Bradley has created a collection of truly wonderful characters to populate Flavia's world, from her mother, who went missing when she was a baby, to her mean (but not always) older sisters and the other investigators she gets to know. Really a delightful series. You should go read it. Right now! You really should read these books in order, because although the murders are somewhat random, there are bigger stories being told across each discrete novel. Happy reading! I have a plan for this week, as long as I don't get dragged back into my fainting couch. I'm going to finish the Beah, then wrap myself up in the Bradley, finally dig into Katherine Arden's The Girl in the Tower, and then finish strong with The Immortalists before I read anymore book reviews about it. Don't tell me !! What's your reading game plan this week? Tell me about a book I need to read!